I eyed the skirt for months before I received mine, and am loving it. It's a classic piece that I am sure I will use for years to come! What do you think of the look? How about the look for less? Leave a comment! Isn't that the BEST? When you find something you got for a steal that's SO much more expensive? I love that! 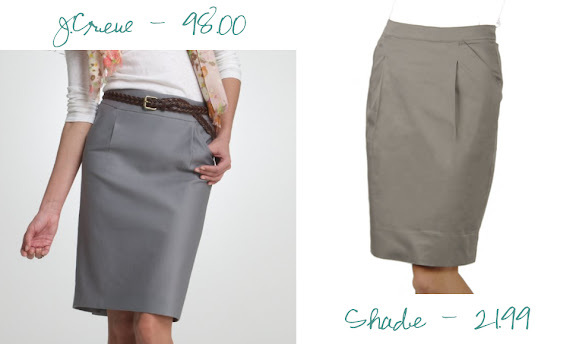 And I love the skirts- both of them, but especially the Shade one, knowing how much less it costs! I really think that, considering the excellent quality of the Shade skirt, and the fact that they look so similar, one would be hard pressed to justify spending so much more money on the J. Crew skirt. I have this in black and it is WONDERFUL. Perfect fit and great for almost any occasion. Thank you! I was looking at this skirt at J. Crew but decided it was too expensive and backed out.